Manchester United forward Juan Mata has been recognised for his work with setting up the charity Common Goal with a royal award in Madrid. The Spanish playmaker founded the charity in August 2017 to help several causes around the world. The movement encourages football players and administrators to donate at least one percent of their salary. On Thursday, Mata was rewarded with the 'Queen Sofia' award at a royal bash at El Pardo Palace in Madrid. 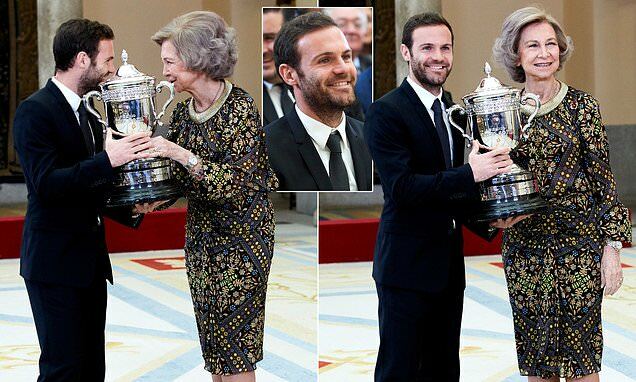 Mata smiled as Queen Sofia herself presented him with a grand trophy, more akin to the FA Cup than a royal award. But it is proof his work is certainly not going unnoticed and is making a difference. The money donated to Common Goal funds charities around the world to combat a number of issues, from HIV to gender inequality. To date, the organisation has 426 members including Leicester goalkeeper Kasper Schmeichel, Juventus centre back Giorgio Chiellini, Brighton's defender Leon Balogun and Bayern Munich defender Mats Hummels. Uganda international Jean Sseninde was the first African and sole female player from the continent to join the Common Goal initiative.